The Internet of Things is basically about networking. But many IT managers are still not exploiting the potential of integration at the levels of data, system and technology. The Internet of Things is gaining momentum in Germany. Over half of companies in Germany already have an IoT vision and act accordingly, as shown by the current Intelligent Enterprise Index from the American company Zebra Technologies. At the same time, 40 percent of companies are also working on a plan for IoT implementation. 79 percent expect to increase investment in coming years. The figures show that resistance is waning in companies. So it is all the more important that IoT projects are not approached half-heartedly, but lead to fully-developed applications and new business models. The dimensions of networking described here show what must be kept in mind. The basis of the Internet of Things is – as the name suggests – the connection of physical objects with a data-driven network. The communication interface is usually created using sensors, which gather and transmit large amounts of information. Here, it is important to prepare the way for productive use: Can the IT infrastructure cope with the large volume of data? Can the data be filtered or compressed right at the start, so that only the important information is passed to further networks? The question of the form in which the digital twin will be shown in the system must be answered satisfactorily, in order to ensure the IoT application is scalable for larger deployments. The market for IoT solutions and solution components is constantly changing, because with every pilot project, new, specialized approaches and best practices are developed. It is important to find a path for your own company on which silos are avoided and the integration into existing systems is seamless. 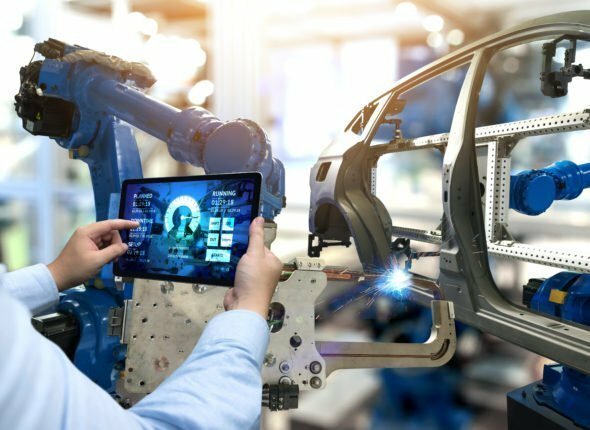 For the SAP world, this means: SAP Leonardo IoT, SAP Leonardo IoT Application Enablement, SAP MII, SAP ME, SAP PCo and SAP Digital Manufacturing Cloud – the list can be extended individually for every company – must be integrated in digital manufacturing in such a way that there is consistency between top floor and shop floor. Only when networking takes place both from physical to digital, as well as from digital to digital, do decision makers have the opportunity to fully exploit IoT potential in business applications and evaluate new business models. The consulting firm IDC predicts that in 2019, basic blockchain services will be in use in 20% of all IoT deployments. Particularly when it comes to manipulation protection for the transfer of data, IoT and blockchain can form a brilliant combination. Use cases emerge that will make the transport of sensitive commodities more secure, for example. Not only blockchain but also other IT megatrends can be combined with applications from the Internet of Things in order to attain a holistic approach: analysis functions from the world of big data, machine learning and machine-to-machine communication from the field of AI (artificial intelligence) or the control of the systems using mobile voice command. Companies that are planning IoT projects can increase the impact by networking the different initiatives for digital transformation in their company and seeking the integration of all activities from the start. Not one-dimensional, but multi-dimensional, is the maxim when it comes to planning and implementing a strategy for the Internet of Things. Foresight and extensive networking are necessary to ensure that the new solutions are a driver for growth and profitability. Now we have covered all relevant topics, right? Well, that´s just the start. Data collection is great, but gaining insights from this data is crucial to derive actions from where the real value is created. Whether this action is an automated one or done by humans doesn’t matter, but closing the loop is essential.